The staff of the Federal Trade Commission has sent warning letters to five providers of environmental certification seals and 28 businesses using those seals, alerting them to the agency’s concerns that the seals could be considered deceptive and may not comply with the FTC’s environmental marketing guidelines. It is often difficult for consumers to tell whether a product has the environmental attributes it touts. For example, consumers cannot reasonably confirm claims that a product is made from recycled materials, when those materials look and perform the same as new materials. Environmental certification seals help address this problem by assuring consumers that they are actually getting the environmental benefit they want to buy. However, these seals and certifications can inadvertently deceive consumers by conveying more than a marketer intends. To help marketers avoid this problem, the Commission issued advice in its Guides for the Use of Environmental Marketing Guides (commonly known as the Green Guides). That guidance explains that unqualified general environmental benefit claims such as “green” and “eco-friendly” convey a broad range of attributes, and that almost no product could have them all. 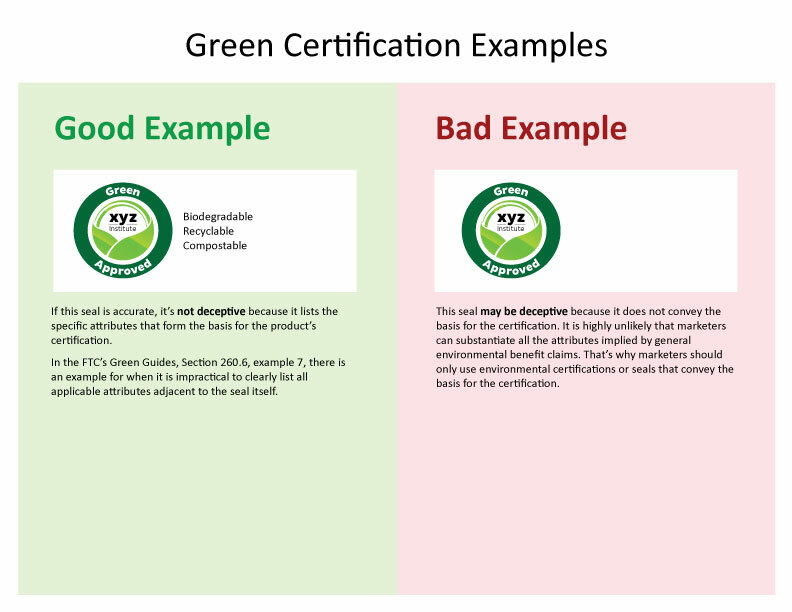 The Green Guides go on to explain that green claims should be properly qualified and provide examples of how to create a seal or certificate that avoids deceiving consumers. The FTC’s new business blog post, Performing Seals, can help marketers understand how certification seals can comply with the Green Guides. It includes two sample certification seals to illustrate dos and don’ts businesses should keep in mind. At this time, no law enforcement actions are being taken, and the FTC is not disclosing the names of the companies it sent the letters. Blog: Does green label = green product? It should.